Surgery is changing rapidly thanks to new technologies. In addition to the robotic devices that offer a steadier hand for certain interventions, there are various other ways that new tech can improve surgical precision. Augmented reality is an example. This week, surgeons at the University of Texas Health Science Center at Houston and Memorial Hermann-Texas Medical Center announced that they were the first in the United States to successfully complete a sinus procedure using augmented reality. The technology overlays guidance tools onto the screen during endoscopic procedures, showing targets and helping surgeons avoid blood vessels and important nerves. “The addition of augmented reality to a surgical navigation serves as a GPS-like system and offers patients the benefits of minimally invasive surgery with lower risks and better outcomes,” Martin J. Citardi, MD, of UT Health said in a statement. 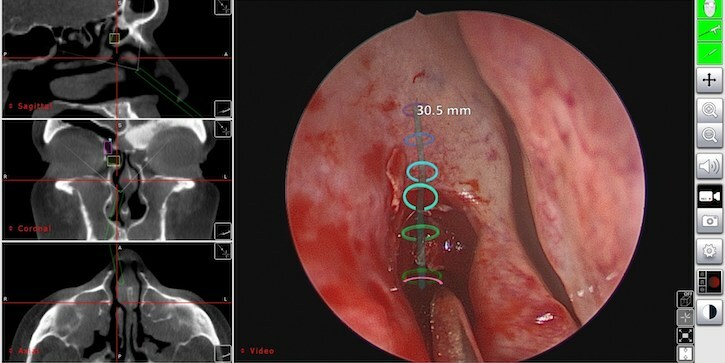 Citardi used the Scopis Target Guided Surgery System to alleviate a case of recurrent chronic rhinosinusitis. "This was a complicated case. By using this technology, we were able to plan a pathway to drain that blocked frontal sinus and avoid the need for a more extensive procedure," he said. Scopis, a German company founded in 2010, is now part of global surgery tech giant Stryker. It requires prior patient imaging to create a roadmap for the procedure. According to Citardi, the system will also allow procedures to be recorded, and it could become vital for training future surgeons. For Stryker, the technology fits into a larger effort to capture the surgical modelling and planning market. In January, it announced a deal to distribute 3D Systems’ virtual surgical planning technology. It also substantially bolstered its ENT surgery business in December when it bought surgical product maker Entellus for over $660 million. Intuitive Surgical, the dominant maker of surgical robots and perhaps Stryker’s biggest competitor in the surgical tech space, also understands the value of recording surgical procedures for analysis and training. It recently worked with researchers at the University of Southern California’s Keck Medicine to develop a “black box” tool for its its daVinci surgical robots, which could someday be used to log maneuvers made with the device.